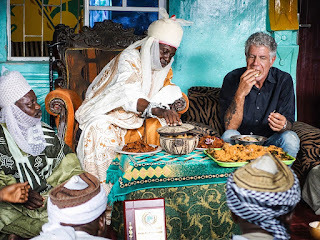 Bourdain has his mind blown by the biggest city in Nigeria. Every Sunday, we live vicariously through Anthony Bourdain's globe-hopping, face-stuffing adventures on CNN showParts Unknown. This week, he takes us to Lagos, Nigeria, a complex city filled with hustling entrepreneurs and a budding IT industry: a place where you "buy, sell, trade, hustle and claw," says Bourdain. "Make your own way, any way you can." Lagos, the biggest city in Nigeria, and it's a madcap open market: Street shops have unregulated pricing and haggling, supervised by "Area Boys" who collect taxes (one way or another). This climate, locals tell Bourdain, allows anyone the opportunity to build from scratch. The wealthiest moguls inhabit Victoria Island, the "Manhattan" of Lagos, filled with vibrant nightclubs and partygoers. Everyone has about "five or six different side hustles"—Banky Wellington, whom Bourdain met for drinks at Rue 80, is a record label owner, actor/director, artist, advertiser, and chef-in-training. Between flashes of club footage and the marketplaces, Wellington and club owner Shina Peller explain the "do it yourself!" culture that fuels Lagos. Victoria Island, or "the garden of dreams," as locals call it, is in stark contrast to nearby Makoko. Per the show, nearly 100,000 people live in the floating village, propped up by stilts and unfailing optimism. Makoko is self-sufficient and self-policing: There's electricity, hotels, schools, and restaurants fully independent of the mainland. As Bourdain gets ferried through the waterways, we see children playing soccer in an elevated schoolyard, and women haggling for groceries at one of the markets. Eviction threats constantly loom, but the people fight back with a famous Lagos spirit, constantly emphasized throughout the episode. And with mainland computer science companies like Andela working hard to create more jobs, there may be more opportunity in the city's future. Unsurprisingly, a little bit of everything, from traditional Hausa tribe dishes like masa griddlecakes to brews with Femi, Seun, and Yeni Kuti, the children of famous singer Fela Kuti. In Makoko, Bourdain sampled a home-cooked meal while he talked with activist Edoato Agbeniyi and Yomi Messou, son a neighborhood leader. On the mainland, he felt the burn while he feasted on pepper soup with journalist Kadaria Ahmed—"It burns. It burns real good." Other Nigerian eats included pounded yams (Nigeria's signature starch), Jollof rice, and Egusi soup, stewed with goat meat, melon seeds, fish stock, and chilis. As food blogger Iquo Ukoh noted, an increasing amount of Nigerians are entering the workforce, so fewer have time for the labor-intensive traditional recipes. But thanks to blogs, classic dishes like Jollof rice live on for people all over the world to enjoy. Bourdain sums up his time in Lagos: “It’s mad, it’s bad, it’s delicious, it’s confusing, and I’ve never seen anything like it.” This is coming from the guy who once ate a still-beating cobra heart. While dining with some food bloggers, Bourdain gets called out for pouring his beer without tipping his glass(we too were scandalized). To which he cheekily replied, "I'm lazy," and joked that one of the bloggers would write that he was an "animal at the table."